At the far end of Limekiln Reach, a long, more or less straight stretch of the Gordon, we reach Eagle Creek campsite. 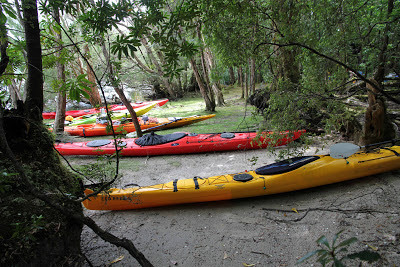 Beneath a canopy of myrtle beech and laurel we find space for easily twenty tents. It is a beautiful setting, near level, above average flood level, and sheltered from light rain by its leafy canopy. But despite appearances the site is hardly pristine. Although there’s next to nothing left, a tourist hut and jetty were built here about a century ago. 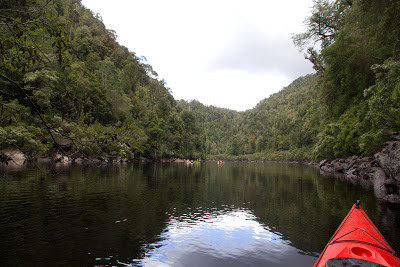 They accommodated the growing interest in river travel in this beautiful area. We’re not surprised that others found it an agreeable place to stay. The river flows like chocolate past green banks draped in Huon pine and ti-tree. Birds flit, float and call across the water. We set up tents and a communal tarp above the kitchen/eating area, and are glad of it when rain starts to fall. It rains all night. It is gentle by West Coast standards – parts of this area receive close to five metres of rainfall per annum – but it is soaking nonetheless. It continues into the morning, perfect weather for lying in our tent and listening to the birds. I struggle to identify them all, managing to pick out Jo witee, green rosellas, golden whistlers, currawongs, grey fantails, and three species of honey-eaters. But there is one call, sharp and sweet, that I don’t recognise. Perhaps, like the whitey wood that’s all around our campsite, it’s a west-coast-only species. European use of Eagle Creek pre-dated popular tourism by a century. Even before the penal settlement was established on nearby Sarah Island, Huon pine had been found in the area. The first specimens were picked up as drift wood in 1804, just a year after European settlement. 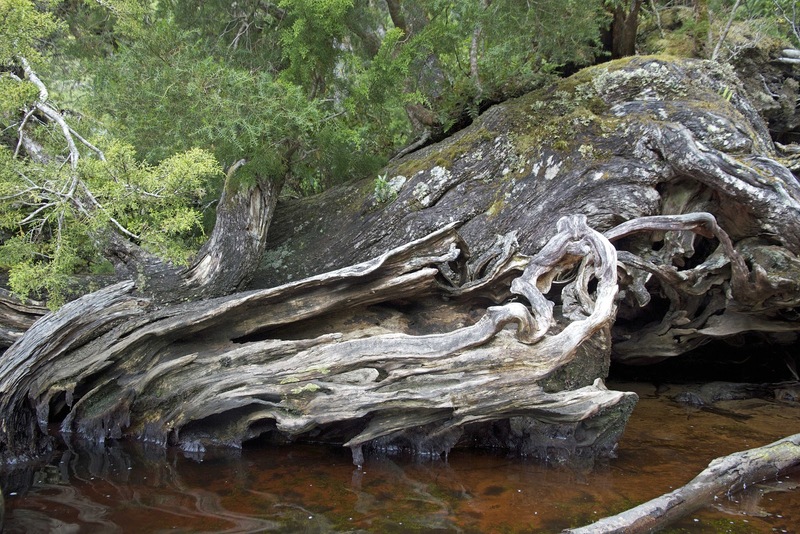 It didn’t take long for sources of this remarkable timber to be discovered: the Huon River first, then the Gordon River and the Port Davey basin. 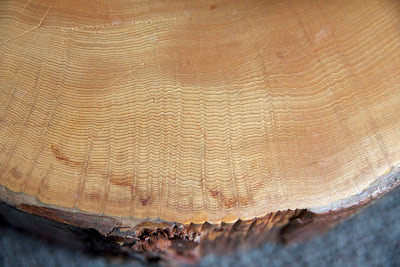 Huon pine (Lagarostrobos franklinii) is only found in Tasmania. 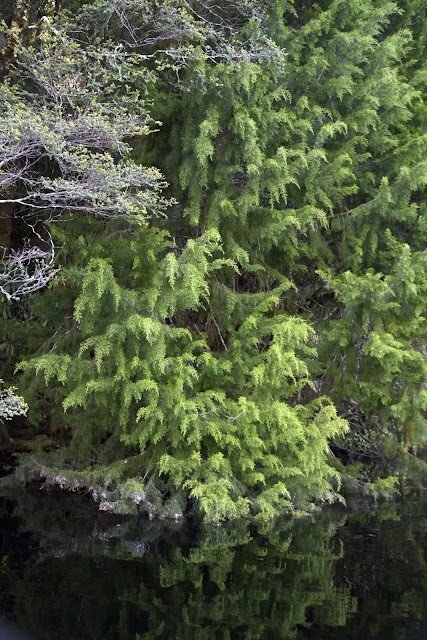 It is not a true pine, but rather a podocarp, and thus related to species found in New Zealand and South America. It was formerly considered part of the Dacrydium genus, whose name means “little tear” because of the drops of sap exuded by a cut tree. What made it so likely to be cut was its amazing resistance to rot, even when totally immersed in water. This was due to its impregnatioin with the oil methyl eugenol, which repels both rot and borers. That made it a supreme ship building timber. Its slow growth and tight annual rings also made it wonderfully workable, including for high value furniture work. Its rarity – it only grows in very high rainfall swamps and forests in the south and west – boosted its economic value. In the Gordon catchment Huon pine was heavily harvested by piners and then convicts from the early 1800s. Convicts had to work in appalling weather, cutting, then hauling the trees out of sodden forests and down muddy slopes to the river or the harbour. They would then fix the logs together into rafts of around 100 logs, before sailing or towing them back to Sarah Island. There the best logs would be used to build ships, the rest would be taken back to Hobart. Despite the high value of the timber, the costs involved in running such a remote penal “enterprise” made it uneconomic. The penal settlement was shut down in 1834, just 13 years after it had started. It seems the convicts hadn’t worked the Huon pine any further upstream than Butlers Island, so there was still plenty of scope for privateers to continue logging. 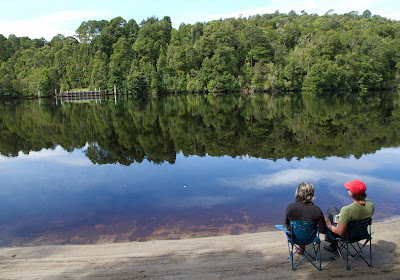 Gordon River pining continued in fits and starts, depending on economic and political circumstances, right into the 1960s. When the rain eases at our Eagle Creek camp, we’re itching for a bit of exercise. We turn inland, walking up the Eagle Creek track, which leads over the Elliot Range to the lower Franklin River. We won’t be heading that far, just stretching our legs by climbing out of the creek’s catchment. We soon realise we’re going where others beside walkers and rafters have trodden. 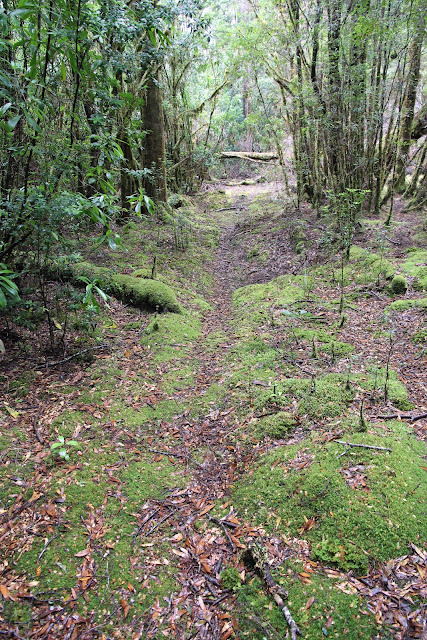 David points out that the scooped path we’ve taken for a walking track is actually a “shoe track”. This, he explains, is the groove made by the piners, who attached a metal “shoe” – curled like the front of a snow sled – onto the leading edge of a log. Bullocks or horses would then haul the log down the track, the shoe acting like the front of a sled and helping the log to slide more easily. It seems a very basic technology, but it was widely used where tramlines weren’t possible … and convicts no longer available. It has us thinking about the harsh lives of everyone associated with Huon pine harvesting. From convicts to privateers, it seems that it wasn’t only the Huon pine that shed tears. 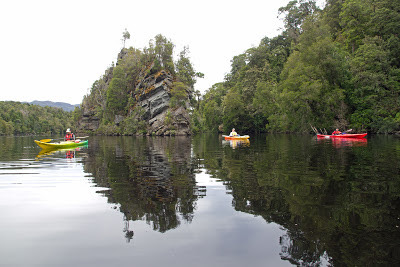 In saying “yes” to this sea kayaking trip on the Gordon River, it didn’t occur to me to associate it with events on the river that said exactly the opposite almost thirty years prior. 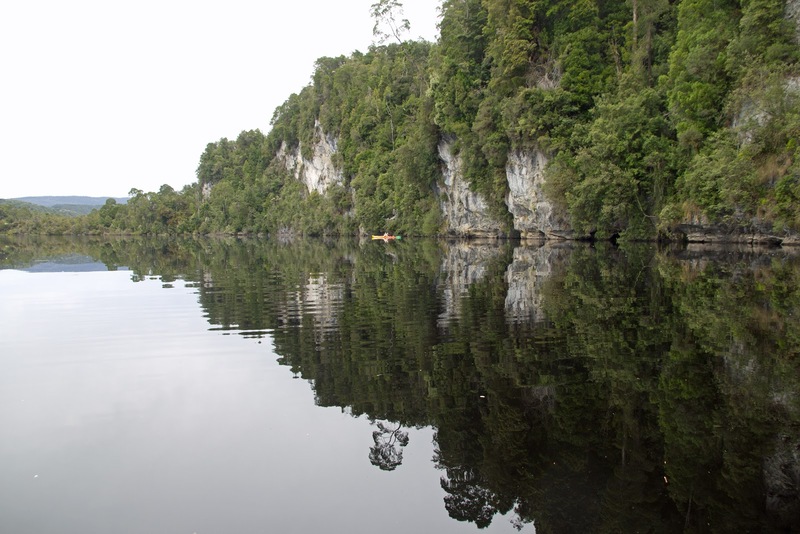 On December 14th 1982 the Gordon River became the focus of national and international media attention. The Hydro-Electric Commission (HEC), whose plan to dam the Franklin River just below its confluence with the Gordon River had the strong support of the Gray Government, was literally bulldozing aside all objections. So in December 1982, a non-violent protest against the dam began on the Gordon River and its surrounds. It came to be known as the Franklin Blockade. As we make our way upstream on the third day of our trip, David names some of the river’s landmarks. Only then does it fully dawn on me that we’re travelling past places I have known through story – you could almost say legend – for three decades. Marble Cliffs, for instance, I recall as a “beauty spot”, much photographed at the time. The real thing surpasses any image. Beautifully pale, steep-sided, impossibly-vegetated, the cliffs plunge decisively into a long, dark, straight stretch of the Gordon. We are rendered speechless, spending more than half an hour slowly pressed up against this geological beauty. When we eventually move on, it comes out that David and Judith both have a long association with these wild rivers. David was a Franklin River rafting guide and operator in the 1980s, including during the blockade. Judith had been a blockader. As we approach Butler Island, vivid blockade stories bubble to the surface. Judith recalls the day a barge carrying a huge bulldozer smashes recklessly through their rubbery flotilla. A banner stretching between the island and the bush-clad river bank is flicked aside like a party streamer. She shivers at the memory, at her feeling of impotence. Blockade leader Bob Brown spoke later of that episode. The bulldozer came up [on the barge]. There were environmentalists in the water, including divers underneath and lots of rubber rafts, but we were peacefully protesting. ... I just want to recapture [the mood]. It was terrifying and it was dreadful and we could see that we were being overrun by the power of the state. We had federal politicians calling for the army to be brought in to remove us from the campsites. That night we camp near Sir John Falls. It's officially called the Lower Gordon Camp, and was an HEC workers' camp in the 80s. There's still a hut there. Ill-furnished and uneasy in its abandonement, it echoes hollowly. A couple of healthy-looking tiger snakes bask in the sun beside the building. We camp nearer the river, beside the sandy beach, beneath some young, well-watered trees. Directly across river from us is Warners Landing, the place the bulldozer was put ashore. 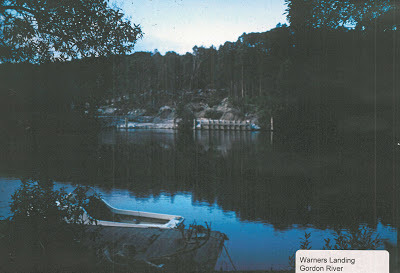 The landing itself is still obvious, large treated pine logs stacked and supported to form an industrial strength jetty. It's the first obvious sign of what took place here 30 years ago. But the rest of this place is the antithesis of industry. We stay for four days, and spend many hours sitting out on the beach. It’s as though we're absorbing peace and greenness through our skin. 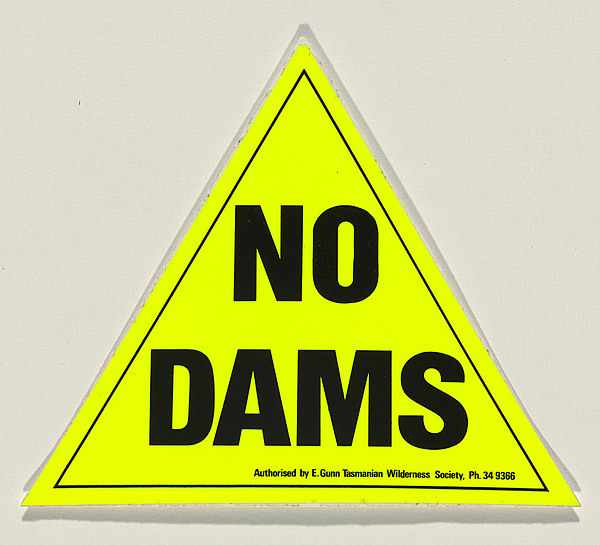 David points across the river to where the very same bulldozer had shoved a road, scraped a vast clearing, begun its push towards the dam site near the Franklin River. Now only the landing itself can be seen. Otherwise the forest has reclaimed the clearing, refoliated the road, obliterated the work site. All is still and calm and green, the river mirroring a forest twin, inverted yet just as vividly verdant. Night falls late and slow, birds call their reveilles, moon and stars shine from the river's depths as well as from a clear sky. After a silent night, Christmas Day dawns quiet and still. We paddle gently upstream through a gorge of ever-varying beauty. The steep sides reach higher now, the forest stacked so impossibly far above us that we have to crane our necks to see the sky. Clouds are darkening and spits of rain begin to fall. As we round a bend David points out the proposed dam site. We paddle slowly, solemnly, each considering what might have been. It is darkly overcast and a blustery wind briefly pushes at our kayaks. For just a moment I allow myself to admire the skill it would have taken to choose the right site, to design the right dam, to build the complex access and infrastructure in such a forbidding place. The moment passes swiftly. Like many of my generation, I had been deeply saddened, scarred even, by the HEC’s drowning of Lake Pedder. That 1970s “triumph of engineering” had cost us an irreplaceable gem. The thought that this incredible place could have gone the same way is a sacrilege I cannot entertain. Soon we reach the confluence of the Gordon and the Franklin, turning up the latter. Although the river level is moderate, we have to push hard against a strong flow where the river is squeezed between Pyramid Island and the other shore. We fail to get much further, and settle for Christmas lunch on the island. As if on cue, the sun comes out, shining benignly on this river of legends. And then it’s cags, chocolate bears, and a CWA Christmas cake on the banks of the Franklin River. I did say it would be a different Christmas!